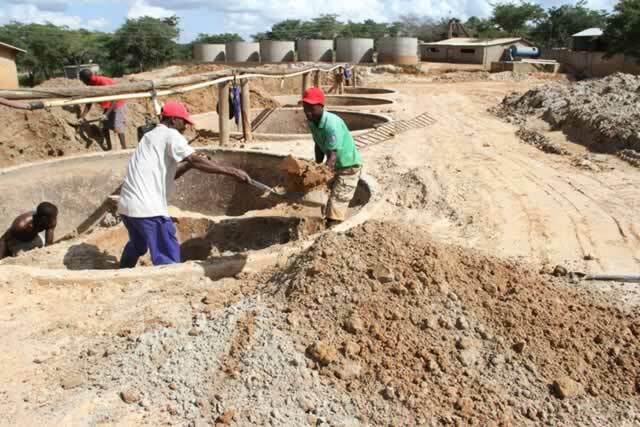 Chimoio (Mozambique) (AIM) – The Mozambican police on Friday seized 28 explosive charges used in illegal mining, mostly for gold, in the Nhatsacara area, in Barue district, in the central province of Manica. In connection with the explosives, the police also arrested three Zimbabwean citizens, currently being held in the Barue district police command, on charges of illegal mining. The police also confiscated four pumps, two motor-cycles, two compressors, hoes, pickaxes and other material used in the artisanal mining. They seized several sacks containing rocks from which the miners hoped to extract gold. The press officer in the Manica provincial police command, Mateus Mindu, told a press briefing in the provincial capital, Chimoio, on Monday that the arrests and seizures were part of a police operation to halt the illegal exploitation of minerals. “A team was mobilised and during patrols, they caught three Zimbabwean citizens red-handed”, he said. “They were carrying explosives to destroy mountains and extract rocks. They have all been detained for investigation”. The subsequent steps, Mindu added, would be to discover where the explosives came from and how they had been transported to Barue. “We found that the material was imported in a scheme that we need to understand”, he said. “Here locally we don’t have an explosives factory. So we think the Zimbabweans themselves brought in the explosives. We are working to obtain more details on the origin of this material”. Mindu promised that the police would continue operations to prevent the looting of mineral resources from Barue, and from other districts in the province.